Wetsuits keep us warm and protect us from the canyon rocks whilst sliding down the rapids. We prefer using long neoprene wetsuits. Wetsuits cover the entire body with knees. Also elbow and hip reinforcements for better protection. The right canyoning tours essential equipment is for safety purposes. The thickness of wetsuits depends on the air and water temperature of where you are canyoning. The canyon of the River Cetina in general is categorised as warm. The water reaches up to 20 degrees celsius in the summer. Air temperature depends on the season. To explain it varies from 20-35 degrees. We normally use 5mm wetsuits early and late in the season. Although 3mm is certainly enough for hot summer days! We are using certified flotation devices or life jackets whilst swimming in the rapids and lakes. They are also useful if you fall. The soft foam on your chest and back will make your landing more comfortable. It is essential to have right equipment for safety purposes. 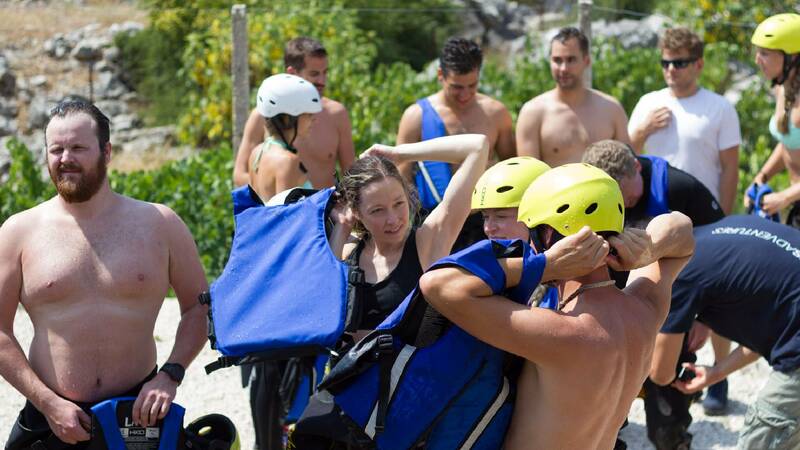 Canyoning harnesses with bum protection are worn no matter what type of canyoning you choose. During extreme canyoning you need them for abseiling down cliffs. In basic canyoning your back needs protection while sliding down rocks and rapids. Bum protectors save your wetsuit from wear and tear. Helmets and protective headgear are used in case you slip or fall. For instance some of the canyons are narrow or have protruding rocks. Therefore we like to keep your head in one piece. Shoes are vital. We recommend trainers or a good sports shoe. If you arrive in inappropriate footwear like flip-flops or sandals, you will need to change them. Canyoning is the same as hiking. It is hard on the feet. If you don’t have any proper shoes you can ask the guides. They will loan you some. But definitely please come prepared.